Baseboard molding installations are very often finished off with a small piece of molding that covers the gap between the bottom of the baseboards and the floor. Two types of molding can be used here: shoe moldings (also called base shoe, or 1/8-round molding) or quarter-round molding. Shoe moldings and quarter-round moldings look very similar, but the quarter-round is a slightly larger piece—a full one-quarter of a round dowel. Shoe moldings or quarter-round are not always a part of the baseboard installation. With ranch moldings and other small baseboard moldings, they are often omitted. Shoe or quarter-rounds are more commonly used with larger, more substantial baseboards, especially those that are built-up with cap moldings at the top. Trim carpenters like to use these bottom trim pieces because they give the project a crisper finished look, and they also reduce the need for complicated baseboard cuts. These bottom moldings can also help hide flaws in the flooring installation since they cover up the gaps at the bottom of the baseboard. Both types of trim are long, flexible lengths of wood (hemlock, oak, pine, etc. ), MDF, or even polystyrene. As the name implies, a quarter-round molding, when viewed from the end, will appear to be a full one-quarter of a full circle, with both flat faces the same width. A base shoe molding, on the other hand, has a slightly different profile, with one flat face larger than the other. This larger face is the one that fits vertically against the baseboard, with the smaller face resting against the floor. Both trim moldings start out as long round dowels that are then rip-cut into their respective shapes. Both types of molding are stocked in very long lengths, racked vertically at the home improvement store or lumber center. The long length is so that you can use full-length pieces to cover most walls. Although you can join shorter pieces to cover a long wall using scarf-joints, most trim carpenters try to avoid this, since full-length pieces give a smoother look. Shoe and quarter-round moldings are quite flexible, intended to bend and conform to the floor profile. Don't worry about buying perfectly straight pieces; they can easily be bent into place during installation. These trim moldings are requisite for some baseboard molding looks, such as large built-up baseboards, but their main usefulness is in masking floor imperfections in older homes where the flooring may be quite uneven. 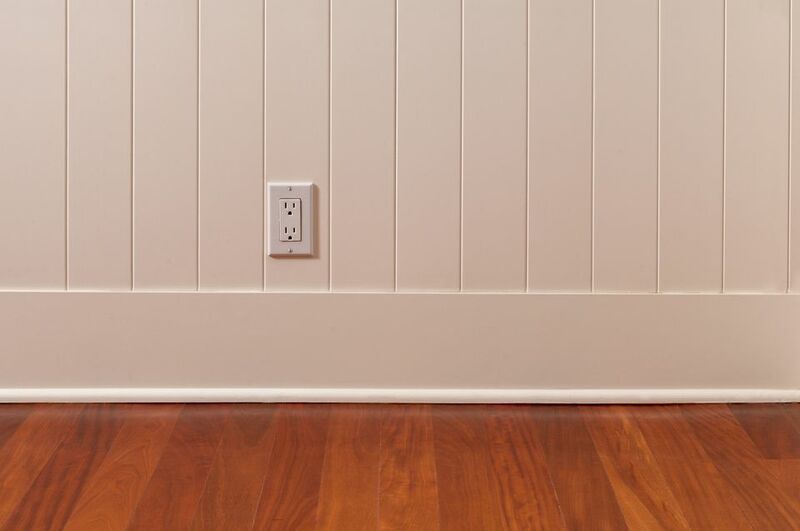 Without shoe moldings, a baseboard must be carefully scribed to conform to the peaks and dips of an uneven floor—gaps that are covered nicely with a molding installed along the floor. In the demonstration shown here, the installation will feature both inside and outside miters to join pieces of moldings at the corners. This requires you to cut the ends of the moldings cut at 45° in order to make the 90° corners. Our demonstration will also show how to cut and install a return—a small piece that can be used to finish off an exposed end of the trim. Quarter round or shoe molding. Most finish carpenters like to finish the long trim pieces before measuring, cutting, and installing them—either by painting or applying stain and varnish. This is considerably easier than trying to finish the shoe molding after it is nailed in place. Although there will be some touch-up needed after the trim is installed, this can be easily done with a brush. Make sure the moldings are clean and smooth—a light sanding might be necessary. Then apply the paint or stain, as desired. With such small moldings, wiping on the stain with ​a rag is often the easiest application method. 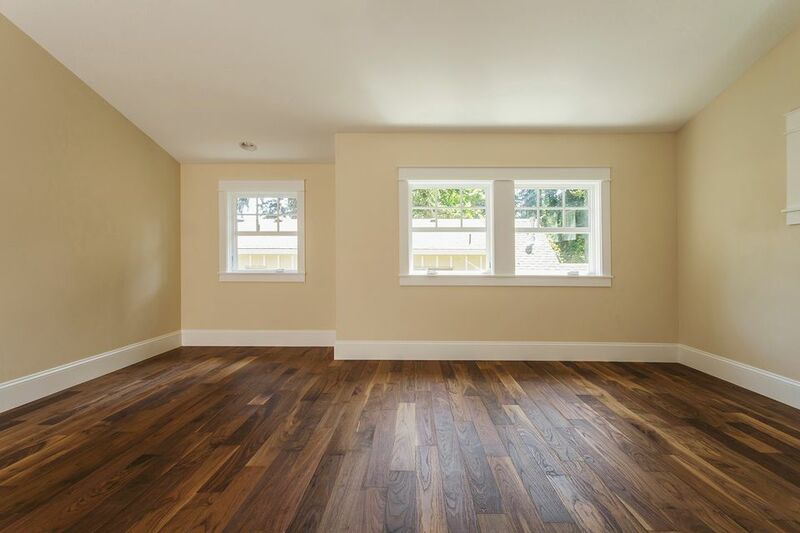 Note: If you choose to stain your moldings, make sure to choose a stain-grade hardwood base-shoe or quarter-round molding, preferably the same species of wood as your baseboards or floors. Pine or other softwoods are great for painting but do not take stain very well. Once the stain has dried, apply a top-coat varnish, following manufacturer's directions. Let the finish dry completely before proceeding to installation. Some confident carpenters will try to measure, mark, and cut all pieces before nailing the first one, but for most people, it will be easier to avoid mistakes by measuring, cutting, and installing the trim one piece at a time. Make a light angle mark to show the general direction the miter cut will make—it does not need to be precise, just enough to indicate the direction of the 45° angle cut. If you are beginning with a piece of molding that will fit inside corners, measure the full length of the wall, and mark a long piece of molding to these dimensions. For precision, you may want to mark the piece slightly long, 1/8 inch or so, to ensure the piece will be long enough. You can always slightly trim the piece down to size if it is too long, but you can't add length if you cut it too short. Set your power miter saw or manual miter box and backsaw to a 45°angle, then position the trim molding onto the bed of the saw. Carefully position the trim pieces so the saw just touches the pencil mark. Make sure the blade is to the outside edge of the pencil mark, "preserving" the mark. It is very easy to cut too short if you cut through the mark itself. If using a power saw, start the saw blade, then slowly and smoothly pivot the saw blade down through the trim. Reverse the saw blade to 45° in the opposite direction, then cut the other end of the trim at an opposite 45° angle. Position the first cut piece of trim in its wall position and check its length. If it is slightly too long, you can take a thin "kerf-cut" slice off one end of the molding to make it fit exactly. Do not fasten the first piece yet; it needs to be movable until you cut the second piece. Measure, mark, and cut the second piece of trim. Make sure to cut the angle correctly so the piece will correctly meet the miter angle of the first piece. Set this second piece of trim on the floor and check its length, as well as its fit with the first piece. Note: skilled carpenters, when faced with corners that are slightly out of square, are able to adjust the angles of the miter cuts to make the trim pieces fit exactly. For example, if an outside corner is 94° rather than 90°, making the trim miters at 47° will create a perfect fit. However, for most DIYers, it's fine to cut at 45°. Small gaps can be filled with matching wood putty. The preferred tool for nailing shoe molding or quarter round is an electric finish or brad nailer. This tool will automatically "set" or recess small finish nails, and can greatly speed up your work. The old-time method of nailing trim was to hammer in nails by hand, then "set" the heads with a nail-set tool. However, this is very time-consuming and difficult. It is much better to borrow or buy an inexpensive brad nailer (you'll find many other uses for it). Drive finish nails/brads about every 18 inches or so, and make sure to drive a nail about 2 inches from each end. Hold the nailer close to horizontal, but angled slightly downward. Hold the trim tight against the floor and baseboard as you fire the nailer. Continue measuring, cutting, and nailing trim pieces around the room, one piece at a time. A return is a small piece of molding that neatly finishes off the end of a piece of quarter-round or shoe molding where it ends without turning another corner. (Return pieces are also found on baseboards and crown molding.) It is not absolutely necessary to cut a return, but it is a nice little finishing touch that makes your work look more professional since it hides the end grain that would be exposed if you cut the trim off straight on the end. For the piece that will terminate in a "return," lay down a piece of molding that is several inches longer than the length you need. Mark your cut point on the bottom of the molding, not the top. As before, lay down a light pencil mark to show your angle. Cut the piece to a 45° angle. Position and nail the piece into place. The return piece is the very short stub of trim that will fit into the angle at the end of the first piece. Position a second short piece of mitered trim against the wall, with the mitered end matching the miter on the preceding piece. Mark the end of the return at 90° end. Cutting the tiny piece of return trim can be challenging, especially with a power saw, where the speed of the blade can break the small piece, or fling it across the room. Here is one instance where you might want to make this cut with a manual miter box and back saw. Cut the small return piece at a 90° angle across its end. Test-fit the return piece to make sure it fits precisely. If not, cut a new piece. Nailing a return piece is not practical, as the wood will split when a nail is driven. Instead, apply wood glue to the mitered edge of the return piece, where it meets the first piece. Do not glue the wall side or floor side of the return piece. Press the return piece in place so the mitered edges meet, and allow the pieces to sit undisturbed until the glue dries. Although rarely needed when you are using a finish/brad nailer, if any finish nail heads remain protruding from the trim, use a nail set and hammer to lightly tap on the nail heads until they are driven down just below the surface of the trim. Touch up the paint or finish on the trim, if necessary. If there are small gaps between molding pieces where the corners were slightly out of square, you can fill them with matching wood putty. With painted trim, you can use caulk to fill these gaps. Baseboard Woes? Learn How to Install on Inside Corners. Caulking Baseboards Is Ineffective. What's the Solution?